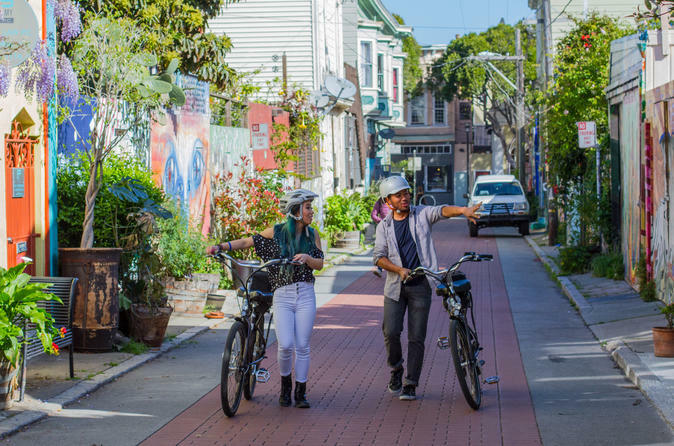 New for 2017, a four-hour electric bike tour featuring plenty of classic SF neighborhoods, parks big and small, and a hilltop view the locals adore. Our Mini Majestic showcases our wonderful city in 4 hours on electric bikes. You’ll experience all kinds of San Francisco: majestic skyline views, beautiful street art in the Mission, the fight for equal rights in the Castro, famous museums in Golden Gate Park, hippie history in Haight-Ashbury, and the iconic Victorian architecture of Alamo Square. San Francisco changes everyday, so depending on the sunshine and your interests, we may visit some other hidden spots as well. Most importantly, you don’t have to worry about those famous San Francisco hills: our e-bikes have plenty of power and battery capacity to propel us up and over them. We couldn’t be more excited to show you around, electric-style.